Pinkfeet may be seen flying over many parts of the county, sometimes in spectacularly large skeins, but the Atlas map shows only those birds using a tetrad, found on the ground or water. They breed in Iceland, with a few in eastern Greenland, and winter mostly in northern Britain, with up to three-quarters of them in Scotland (Winter Atlas). Their main wintering areas in England are Lancashire and Norfolk, and there are normally few records south of Cheshire. The Atlas map exaggerates the species’ status in any one year. 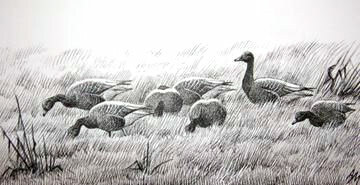 Most of the records are of odd birds or of small groups comprising up to seven birds, often consorting with Canada Geese and arousing suspicion of their origins. There were just twelve submitted records of flocks, from 41 to 200 birds, eight of them along the edge of the Dee estuary. The others were from the Dee flood plain (SJ44I), two tetrads in the Sandbach flashes in January 2005 when Andy Firth noted that ‘several skeins of up to 250 flew over but a few landed and stayed a while’, and from the Toft area (SJ77N) in winter 2004/ 05 when 120 birds fed on stubble. Apart from this one record on stubble, all the rest were on grassland (either semi-natural or improved agricultural land), saltmarsh or large waterbodies. The present picture is probably little different from the species’ historical status in the county, although the size of the population now is much larger and shooting pressure much reduced. Many 19th century records of geese are clouded by doubt over the species’ identity, but Coward & Oldham (1900) gave a few examples from the Dee in the last years of the 19th century. They commented that Pink-footed Geese were not often noticed farther inland, and their only examples are two records of birds shot at Tattenhall. A decade later, confidence in identification had obviously advanced and Coward (1910) declared that ‘the Pink-footed Goose is undoubtedly the goose of the Dee Estuary’. The bird was formerly common in the Mersey but was seldom seen on the estuary at the time of their writing; Coward does not mention it, but the opening of the Manchester Ship Canal in 1894 must have made a substantial difference to conditions in the Mersey estuary. Boyd (1946) commented that they seldom go far from the coast, and noted the perennial problem in 1938 when he was fooled by an escaped aviary bird into thinking it was wild. Bell (1962) gave no records from the first half of the 20th century but listed roughly annual records of birds seen in flight in the 1950s, especially over Hilbre and Wirral. The records in the annual county bird reports from 1964 onwards are almost all of overflying flocks with only odd others, as now. The notable exception was a significant influx in freezing weather in January/ February 1979, the hardest winter for 16 years and the first since the Lancashire population of Pinkfeet had grown so large (Forshaw 1979). Many of the 20,000 birds quit Lancashire as their feeding areas were blanketed with snow, and 1,150 moved into the Dee estuary, feeding by day in barley stubbles south of Burton and roosting on the estuarine saltmarsh at night. After a week half of these birds left, but more arrived after a few days and the flock built up to 1,500 by mid-February. It was interesting that some of the species’ old Dee haunts were re-visited after a long absence. Lesser flocks were also found elsewhere in the county, notably 227 on fields at Bartington Heath (SJ67D) for a week.